For as long as I have been blogging now (a little over 2 years), I’ve come across the word “tone” in just about every question, comment or post that I get. I must admit, even I have tagged my posts with the word, because I know that more often than not, girls find my blog by searching with that word. I understand that it is a very popular word, especially among women, as it suggests a certain fit look. But it’s important to realize that the word tone is a sales ploy (not a scientific term) typically aimed at women who are not familiar with working out or the process of getting in shape. More than anything, the point of this post is to explain exactly what “tone” is and how to achieve it, so that you ladies won’t fall victim to a clever marketing gimmick on a product that might not be necessary to reaching your goals! Let’s take a closer look at what most girls have described “tone” as to me: Tone implies a fit body with some muscle definition and not a lot of visible fat. It is a healthy and desirable look with feminine curves, but not much “bulky muscle”. What tone really is: building muscle and then losing body fat. 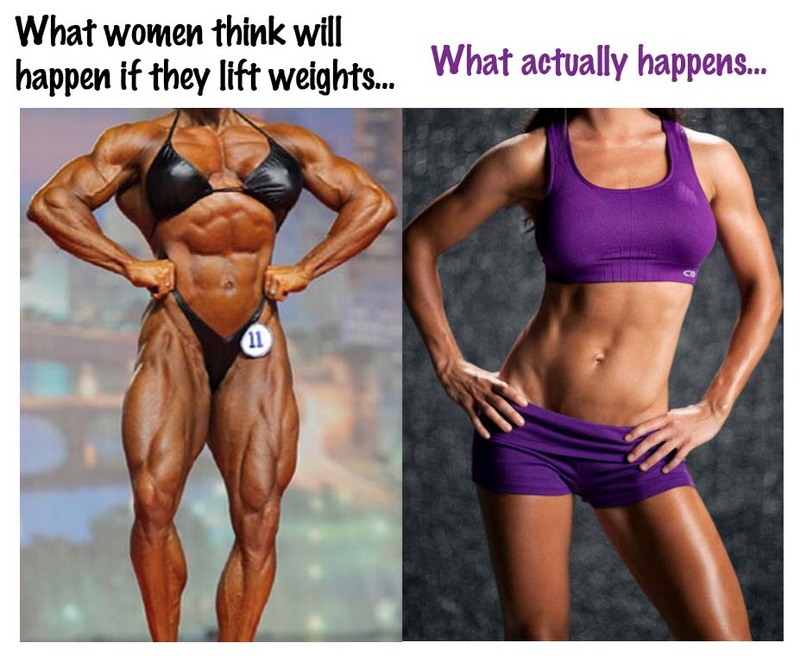 Myth #1 Keeping You From Your Goals: Unfortunately, the myth that women are capable of bulking up and building muscle like a man is still annoyingly persistent. I’m not sure who invented this silly fallacy, but if I were to ever meet them, I would certainly give them a piece of my mind 😉 Women do not have the levels of testosterone necessary to “bulk up” the way men do. Even MEN have trouble putting on muscle mass. When I hear girls and guys tell me they “don’t want to get too big”, I can’t help but sigh. You will NOT be able to pick up a pair of heavy dumbbells and wake up the next morning looking like the incredible hulk. Most men and women have no idea how much effort, time, dedication, and discipline it takes to achieve “tone”, let alone a muscular physique! Remember, if it were EASY to be that in shape and all it took was picking up a heavy weight now and then, EVERYONE would be in shape! ***Now by no means am I knocking the physique on the left (in fact, I admire her), nor am I suggesting the physique on the right (mine) is the ideal physique. What I am demonstrating in this picture is that lifting heavy weights will not make you look like the picture on the left UNLESS you are taking steroids and have committed your LIFE to achieving it. The woman on the left has spent YEARS lifting, eating, sleeping and breathing a specific lifestyle that will get her to that point. Her physique did NOT happen by accident and it did NOT happen overnight. And neither did mine on the right! I have also spent years lifting, eating, sleeping & breathing the lifestyle I want to achieve MY ideal physique. Myth #2 Keeping You From Your Goals: So many women believe that they can just do a bunch of cardio and diet to “lose the weight first and then tone up” afterward with resistance training. But the problem lies in the fact that if you have built NO muscle, you won’t have anything to “tone”! Just for the record and for those of you who didn’t already know this, it is physically impossible to turn fat into muscle. Fat and muscle are two entirely separate tissues in the human body, one cannot become the other. In other words, you cannot “tone” fat. It’s so important to focus on building a solid foundation of muscle FIRST. Keep in mind that muscle is metabolically active tissue… The more muscle you have on your body, the more calories you burn just by being alive! Pretty great right!? This increased calorie burn makes it THAT much easier to lose body fat! In addition, with an increased calorie burn, you can eat more calories than you could have with less muscle on your frame. So what’s my “beef” with the word? I mean after all, it is JUST a word. But the truth is, this word gets in the way of results. It gets in the way of progress both mentally and physically. People get so caught up being afraid of the myths I mentioned above and focusing so much on what they falsely believe this word to be, that they don’t train hard enough to ever reach their goals. Think about it this way, if you are like me, you probably toss anything and everything into your large purse. By the time you’re walking out the door, the thing weighs a good ten pounds! Does lifting that purse make you “tone”? Does lifting your hair dryer, water bottle or back pack make you tone? Now if those don’t…. why would a 5 pound dumbbell do that? It won’t… and that’s because in order to build muscle, you must CHALLENGE your body with heavy weights! I constantly challenge my body with heavier weights, and by no means do I look “manly” or “bulky”. Now For The “How To”: In order to build muscle, and then lose the body fat (which at this point you realize is what “tone” really means), you must eat a nutritious diet with plenty of protein, complex carbohydrates & healthy fats. You must also regularly perform challenging, resistance training several times a week and incorporate cardiovascular exercise as well. 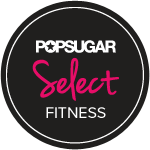 Keep in mind that the AMOUNT and TYPE of cardio is completely dependent upon your body type, your nutrition, your individual goals and a variety of other factors. So you will have to experiment and figure out what works best for YOU. There are some supplements that can help this process, such as protein powder and fish oil. However keep in mind supplements are meant to supplement, not take the place of a nutritious, balanced diet. Work hard and have patience with yourself. It takes time and a great deal of effort, but if you believe you can do it, you WILL. Here are some articles you might find helpful in achieving a healthy, fit body! 5 Tips for Succeeding at Your Healthy Goals! MORE NUTRITION ARTICLES CLICK HERE!